Business Cards Letterheads Envelopes Business Forms Flyers & Posters Manuals, Booklets and Catalogs Product Sell Sheets Presentations Folders Brochures Rack Card Brochures Calendars Newsletters Menus Postcards Direct Mail Cards Note & Scratch Pads Labels & Tags Door Hangers Campaign Literature Rubber Stamps Name & ID Badges Doors Plaques Banners Yard Signs All Your Printing Needs! We Can Design Your Printing or Print from Your Digital Files! For over 50 years it has always been our goal to provide customers with the best service and product possible. 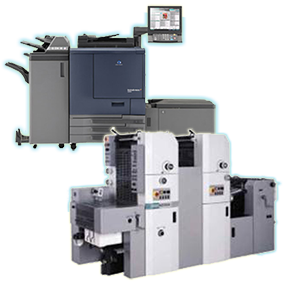 You will be given personal, experienced and professional assistance so you printing will fit your needs, be of high quality and affordably priced. We offer graphic design as well as the capability to accept a variety of customer provided digital files. In addition to our offset printing department, fast, high quality digital printing is available even for envelopes. Please call or email us for price list or quote. Be sure to check out our weekly special!